Health-conscious consumers already know that wild Alaskan salmon is one of mother nature's superfoods. But unless you buy your seafood directly from a trusted source, there is a high chance your wild salmon is actually farm-raised. After Oceana conducted DNA testing on samples of salmon collected from stores and restaurants in the United States, the ocean advocacy group discovered that a whopping 43% of samples were either farmed salmon marketed as wild or a completely different, misidentified species all together (1). Don't be a sucker. 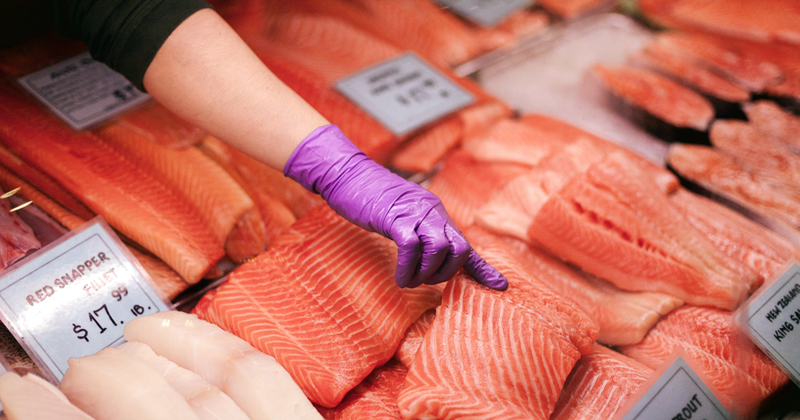 Aside from joining a seafood membership with a trusted service and supplier, here are three easy ways to spot seafood fraud and identify real, wild Alaskan salmon. The flesh of a farmed salmon typically has thick white stripes of fat. The fat of a wild salmon is more integrated with the muscle tissue and looks less zebra-like. Farmed salmon are generally kept in small, enclosed feedlots, unlike wild salmon that roam the open waters. It's simple. More exercise equals less fat. And a lot of times, farmed salmon are fed an unnatural diet that is intended to make the fish gain weight rapidly. The fat in farmed salmon isn't the healthy kind of fat either. Because of its diet, farmed salmon packs a lot more omega-6s in relation to its omega-3s (the healthy fatty acid you want) than wild-caught salmon (2). Wild salmon are typically a deeper red than farmed. As migratory predators, wild salmon hunt for their food and prey on many types of smaller, wild species like shrimp and other free-floating crustaceans. These crustaceans contain carotenoids, a molecule that causes pigmentation. You might have heard of the baby who ate too many carrots and started turning orange. It's the same thing. Farmed salmon, on the other hand, don't get to roam the ocean and hunt for their food. Instead, they are typically fed unnatural pellets that contain dye in order to acheive the color of wild-caught salmon. So, no red shrimp means no deeper red flesh for farm-raised salmon. Wild salmon is almost always more expensive than farmed. But you get what you pay for. Typically, the restaurant owners and fishmongers who serve wild salmon make a big deal out of it. They want to make sure you know it's wild to justify the price they need to charge. If they stay quiet and the price seems too good to be true, it's probably not wild-caught. The easiest way to avoid seafood fraud is to connect directly with a trusted supplier, such as the Wild Alaskan Company, a direct-to-consumer seafood membership service that takes all the guesswork out of eating top-quality wild seafood. Click here to buy your wild seafood!